Henry Knollys was the eldest son of the Treasurer of the Royal Household, Sir Francis Knollys Senior, and his wife, Catherine Carey, a maternal cousin of Queen Elizabeth I. He was apparently educated at Magdalen College, Oxford and, after accompanying his father to Germany, is said to have matriculated at the college (although his name does not appear in the university register) and to have obtained there the reputation of being a very cultivated and religious man. In 1563, at only nineteen, he was elected MP for the Borough of Reading and, the same year, he bore the Queen’s train at the Order of the Garter’s St. George's Day celebrations at Windsor Castle. Two years later, on 16th July 1565, he married Margaret, the sixteen-year-old daughter and heiress of Sir Ambrose Cave, the Chancellor of the Duchy of Lancaster. The wedding took place at Durham Place on the Strand (the Bishop of Durham's former London residence) and the Queen was the guest of honour. In the November of the same year, Henry is recorded attending the wedding of Ambrose Dudley, the Earl of Warwick (and his sister’s future brother-in-law), where he was the first of the challengers in the celebratory joust, overthrowing Henry MacWilliam. 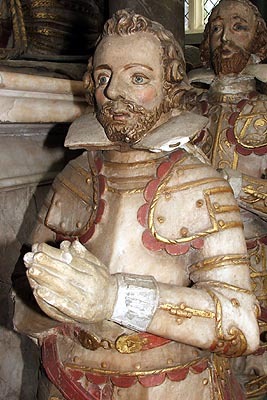 In 1568, Henry and his wife inherited the former monastic lands of Kingsbury, Hemlingford and Nuneaton in Warwickshire upon the death of the latter’s father. They lived at Kingsbury when in the Midlands, at Ewelme when in the Thames Valley, and at Greenwich when in the Capital. Henry served against the Northern rebels in 1569 and the Queen wished him to take custody of the rebels’ lands, but they had already been given to the son of Sir Ralph Sadler. By 1570, Henry had been appointed Esquire of the Body to Queen Elizabeth and, the following year, he transferred his parliamentary seat to the county of Oxfordshire, conjointly with his father. Amongst other duties, he sat on the committee to consider what should be done with the captive Mary, Queen of Scots, who had previously been in his father’s custody. About the end of August 1573, Henry accompanied his brother-in-law, Walter Devereux, Earl of Essex as a captain on his military expedition to Ireland. However, the Lord Rich's affairs soon called him back to England and he returned within a month, pleading ill health. Five years later, he decided to turn to the sea and joined Raleigh’s half-brother, Sir Humphrey Gilbert, in a venture designed to set up a new European colony on the east coast of North America. However, Henry was more interested in plundering the Spanish Caribbean, a course of action which was both profitable and harmful to the hated Catholics. Gilbert gathered eleven heavily armed ships at Plymouth. The nearly 600 strong crew, however, mostly consisted of convicted pirates, especially pardoned for the voyage. Along with his infamous pilot, John Callice, Knollys soon argued with Sir Humphrey and, refusing to acknowledge his authority, they took three ships (later joined by more) to the Spanish Coast on a purely piratical cruise. Further disasters dogged Gilbert and the expedition never actually made it across the Atlantic. He complained to Sir Francis Walsingham of Knollys’ “unkind and ill dealing” and, in late 1579, Henry was accused of receiving piratical goods and of attacking subjects of the King of Spain. In the last year of his life, Henry organised an expedition to Portugal in support of the Royal claimant to the Throne, Don Antonio. However, the English Privy Council objected and he was ordered to return home. He later joined his 'cousin' - they were actually half-third cousins - John Norreys, fighting for Dutch independence from Spain. He died there, presumably of wounds or disease, on the day he made his will, 21st December 1582. Henry and his wife had two daughters: Elizabeth (dead by 1632), who became the wife of Sir Henry Willoughby (d.1649) of Risley in Derbyshire; and Lettice, who married William, 4th Lord Paget (d. 20th August 1629). His widow survived him by eighteen years, dying on 15th August 1606. She was buried at Hadley, near Barnet, in Middlesex. © Nash Ford Publishing 2001; 2008. All Rights Reserved.